Built in 1779 in Beverly, Massachusetts, the Defence sailed that July from Boston to take part in the siege of the nascent loyalist colony at Fort George in Penobscot Bay. Poor leadership led to disaster. The siege floundered while the continental army and the navy failed to cooperate. In August a supporting British unit appeared on the scene. The American fleet, faced with a smaller but tactically superior force, fled up the bay to founder in the shallows. With no escape by water possible, the ships were scuttled, blown up, and burned. In 1972 the Maine Maritime Academy and the Massachusetts Institute of Technology undertook the search for the Defence, locating the hull in three days. 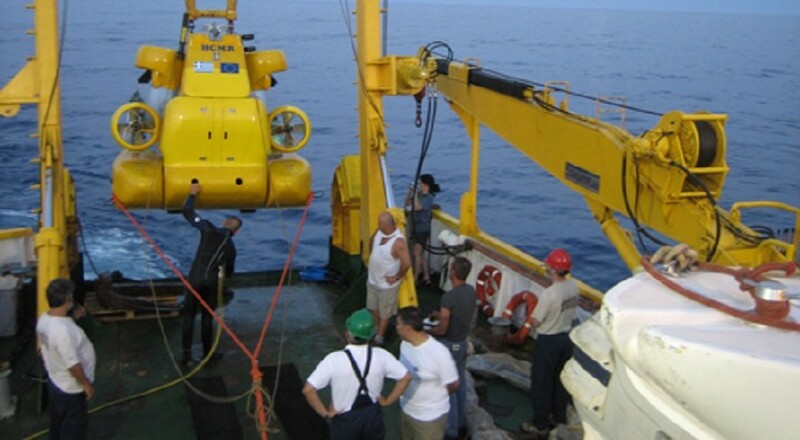 The first ship of the American Revolution to be fully scientifically excavated, the project began in 1975 as a joint undertaking between INA, the Maine Maritime Academy, and the Maine State Museum. Upon excavation it was found that much of the ship’s supplies had been abandoned at the time of her destruction. Fifteen casks of foodstuffs, many having originally contained salt pork, were found in the bow. A large brick galley stove was found just behind the foremast. The stove included a large two-chambered copper cauldron around which the bricks had been laid. Mess tools as well as personal utensils were found in this area as each man kept his own bowl and spoon marked with his initials. Amidships was a plethora of personal items for the 100 man crew including clothing, shoes, and buttons. Aft of this was the shot locker filled with cannon balls. The officers’ quarters in the stern were completely blown to bits as this was where the destructive charges were laid when the ship was scuttled. Ford, Barbara, and David Switzer. Underwater Dig: The Excavation of a Revolutionary War Privateer (William Morrow, 1982). Mayhew, Dean, “1779 Penobscot Bay Expedition 1975,” INA Newsletter 2.2 (1975) 1-3. Riess, Warren, and Geoff Daniel, “Evaluation of Preservation Efforts for the Revolutionary War Privateer Defence,” IJNA 26 (1997) 330-338. Sands, John O., “Gunboats and Warships of the American Revolution,” Ships and Shipwrecks of the Americas. George F. Bass, editor. (Thames and Hudson, 1988): 149-168. Switzer, David C., “Excavating the Defence,” INA Newsletter 2.2 (1975) 3-4. Switzer, David C., “The Penobscot Expedition, 1976,” INA Newsletter4.1 (1976) 1-5. Switzer, David C., “Provision Stowage and Galley Facilities Onboard the Revolutionary War Privateer, Defence,” Beneath the Waters of Time: The Proceedings of the Ninth Conference on Underwater Archaeology, Barto J. Arnold III, ed. (Austin, 1978) 39-49. Switzer, David C., “The Penobscot Expedition, 1977,” INA Newsletter4.4 (1978) 1-4. Switzer, David C., “Excavation of the Defence – Final Phase,” INA Newsletter 10.1 (1983) 1-2, 4-5. Wyman, David B., “Searching for a Fleet,” INA Newsletter 2.2 (1975) 5. Wyman, David B., “Design and Construction of the Defence,” INA Newsletter 4.4 (1978) 5. 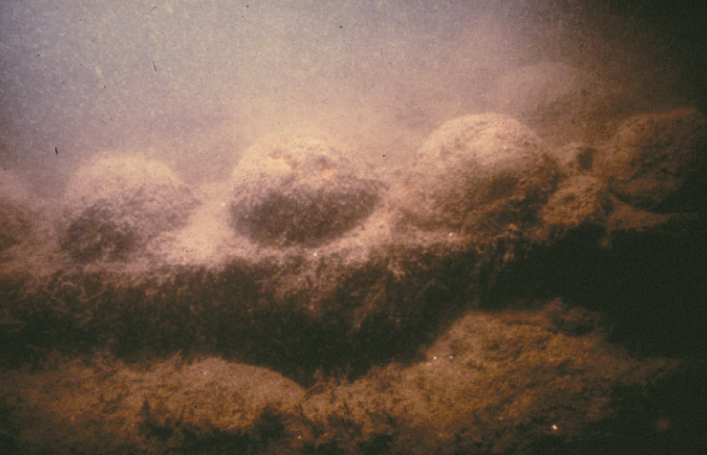 ABOVE: Cannon balls were held in shot garlands. The ship’s main armaments consisted of 16-pound guns (Photo: INA).